Planning a wedding can be a wonderful but overwhelming thing at times. This is no exception when it comes to choosing a wedding photographer to capture your wedding day. As a former bride myself and now a professional wedding photographer I'm hoping the following tips will help you make the best decision for your wedding day. While putting together this article I asked for input from a group of past brides, asking them what made them choose their wedding photographer and what advice they would have for brides-to-be. I hope these tips help you in finding the best fit for you in a wedding photographer for your wedding day. 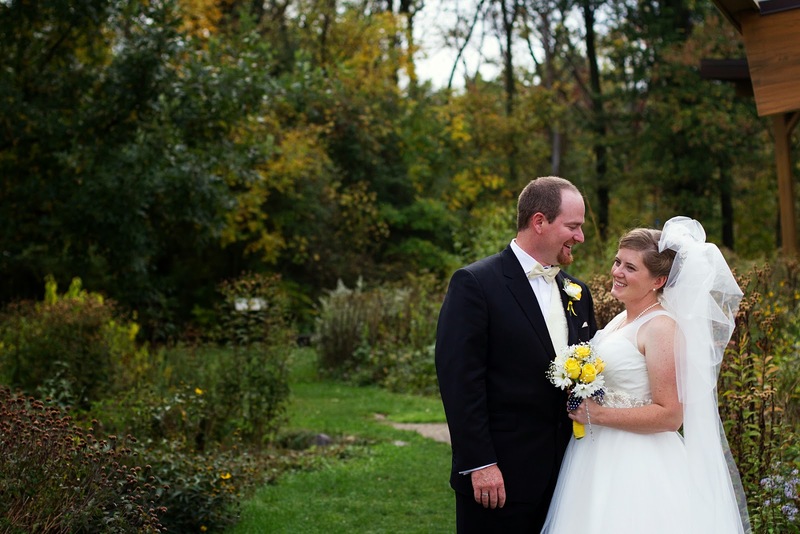 When searching for your wedding photographer you will likely view many websites, portfolios, and Facebook pages. You may also choose to use a website like The Knot or Wedding Wire to help with your search. 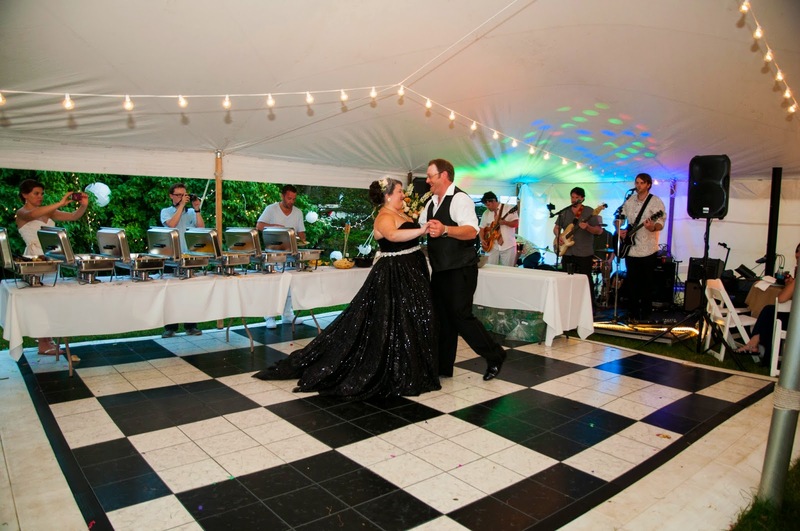 You will want to pay close attention to reviews from past brides and grooms. I personally have a website with The Knot.com and I love that my brides can write reviews and let me know how I did on their wedding day, where I can always be improving, and help with engaged couples looking for a wedding photographer. Reviews from past brides are an awesome indicator of their experience and what you can expect from a specific photographer. Ask your friends who have recently married for referrals! 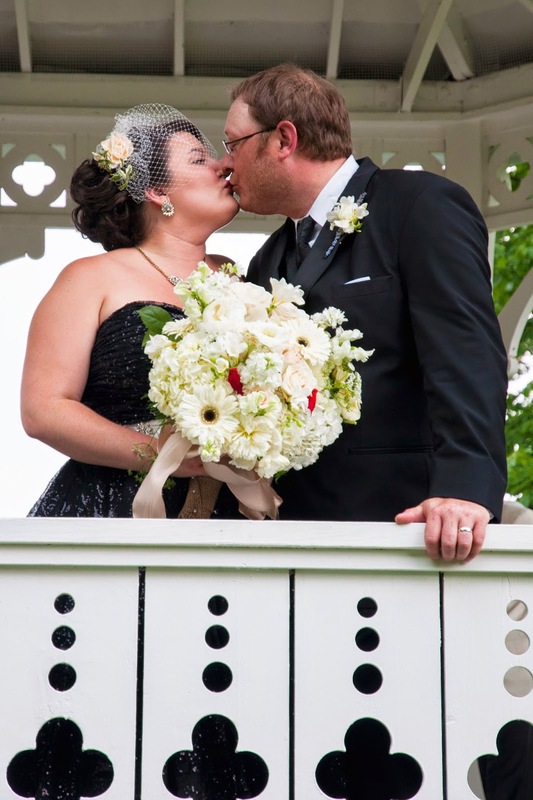 Wedding photographers vary with their artistic and personal style. It is best to pinpoint what style fits you and your significant other's personal style the best. For example, if your wedding style is more traditional, you most likely would not choose a photographer who only captures photojournalistic work with no posing. Often, you can find a photographer that is a good mix of the two. The best way to figure out a photographer's style is to look at their portfolios online and ask to see one or two of their latest weddings. This will help you determine whether their style and artistic perspective is the right match for you. Also, does the photographer have diversity in their portfolio? I try to show as much diversity as possible in my work, because I want potential brides to identify with my work and my values as a photographer. The quality of a product, in this case, your wedding day photography, is a combination of talent, experience, and judgement by your photographer. It is okay to ask how many weddings a photographer has worked on, or to look and see how many years they have been in business and photographing weddings. This is not to say that the longer the photographer has been in business the better their work is, or necessarily the best fit for you. 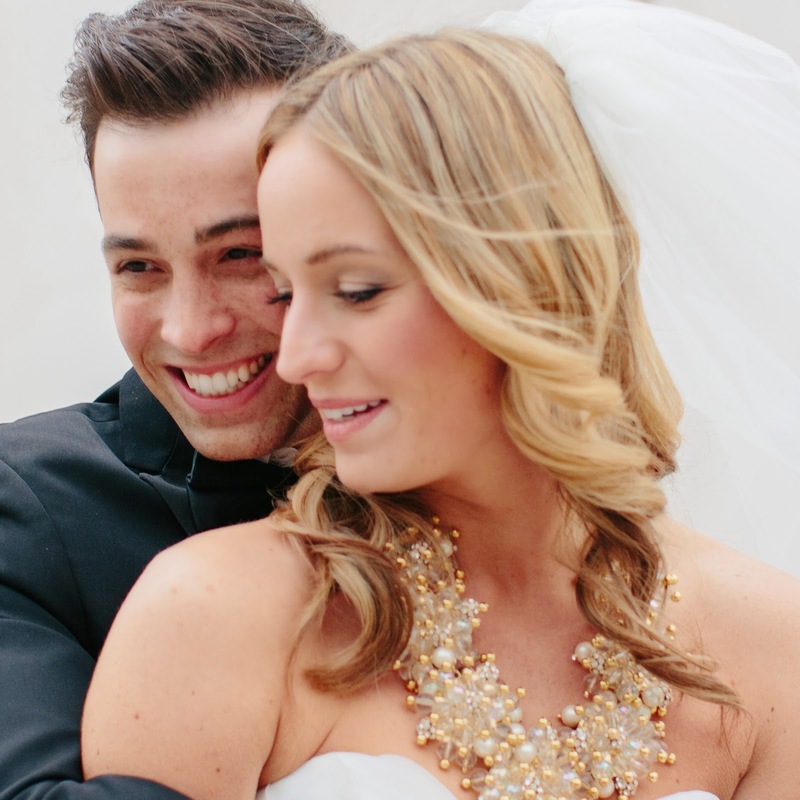 You just want to see that you can trust them to capture your day based on their past wedding experience. Experience is also important from your first contact with the photographer. Is he or she responsive to you questions and concerns, and do they seem attentive and willing to take the time to get to know you and your fiance? 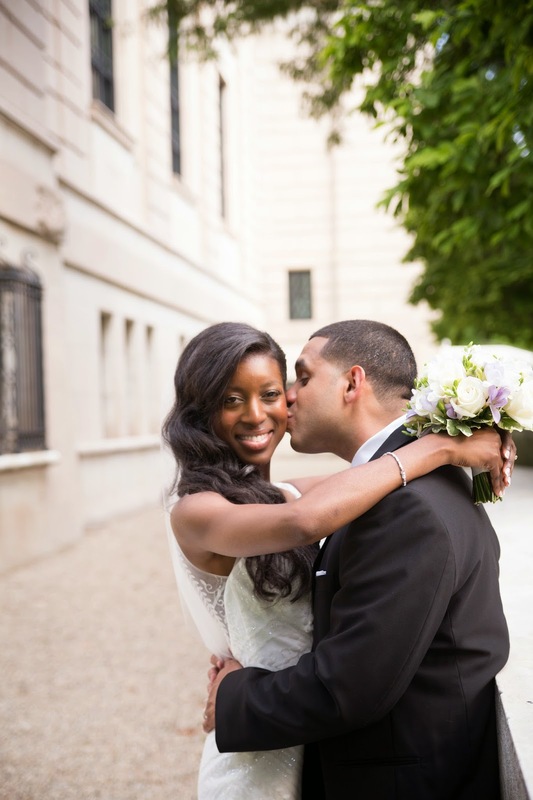 All of these things will help in your decision process when choosing your photographer. In my case I was a bride before I was a wedding photographer, but when I met my wedding photographer in person, saw her portfolio, loved her style and demeanor I knew she was the right fit. She had collections that fit my needs and was willing to create custom collections so I could get all the things I needed. Congratulations on your engagement and best wishes as you plan your wedding day! Guest Blogger: Sylvia Farmer, Bridal Beauty Detroit Owner/Lead Artist ~ Are you Ready for Your Close-Up? 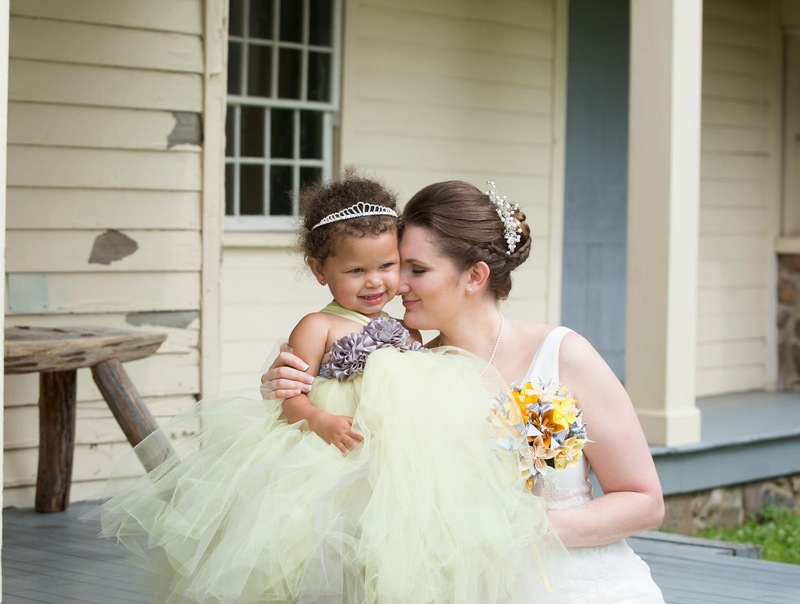 Everyday makeup just doesn’t cut it for an extraordinary occasion like your wedding day. Here, the following key points: On your wedding day you will be wearing an elaborate, often expensive, light colored garment usually exposing your shoulders, arms, and décolletage, which may be a different shade than your face and require some color correction. Colors in the white family (even warmer ones like cream & ivory) can leave you looking washed out and tired unless your features are properly balanced and accentuated. Speaking of accentuating your features, realize that as the star of the show all eyes will literally be on you! From afar, close up, and all day from all angles, for hours and hours…friends, family, (and your photographer) will be looking at you and snapping pictures, shooting video, and sharing on social media. These pictures are going to be looking back at you for the rest of your life and with HD photography the stakes are definitely higher. Knowledge is power! A professional makeup artist will with experience will know exactly what to do. While each bride’s request is different (some like it natural, others like a more dramatic look) each will be done perfectly so that it looks great for the camera. When you find the right artist, book them (and expect to sign a contract): When you find a professional whose work you not only love, but can also get along with on a personal level, it is vital for you to book them as soon as possible! We professionals tend to book up quickly (about a year in advance) especially during wedding season (March-November) so it’s really important to lock down your artist as soon as you find the one that fits you best. Also, any professional working in the wedding industry is going to contract you; Makeup is no different. I know many women see makeup as something frivolous and would never think it necessary to need a contract, but in reality it is quite crucial and beneficial for all parties involved. Contracts help to keep everyone clear and on the same page in terms of expectations, and helps to provide ways of resolving conflicts that may occur. It also keeps the makeup artist from bailing on you last minute (which should never happen if you’re working with a true professional). Like most wedding professionals, no dates are set aside for professional makeup artists until the contract is signed and returned, and deposit is received. Value that you are worth it! You have spent so much money on your photographer, your dress, your venue…why would you skimp on your face? 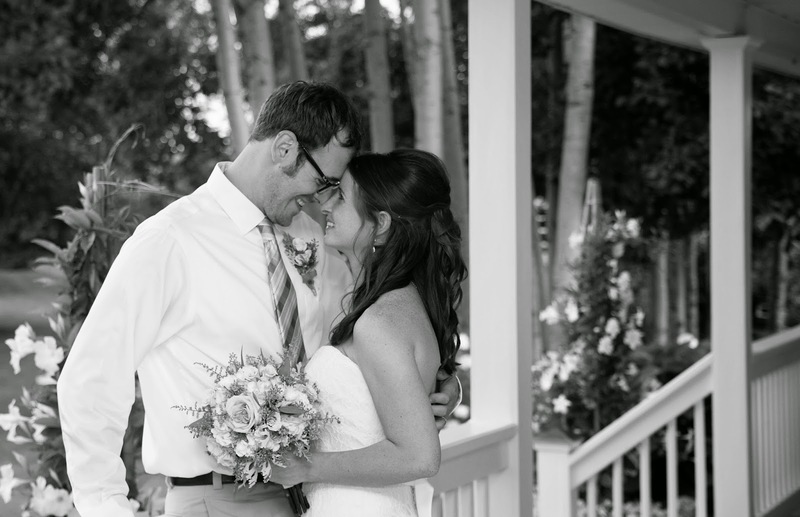 You will be looking at your wedding photographs for the rest of your life. Although you may do a great job on your everyday makeup, for your wedding day, hire someone who specializes in makeup for photography. 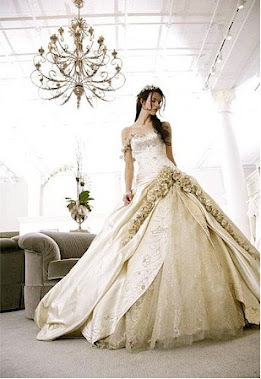 Your wedding is a special day and looking as good in photos as in real life is supremely important. Longevity is key to professional wedding makeup! Whether your artist uses airbrush makeup or traditional makeup, they will know what products to use to keep your makeup lasting all day and all night. Living in Michigan we know how to keep brides makeup lasting all night in the heat without sweating off before the reception is over! It is not an easy task, but with the right products it is definitely attainable. Bridal Artists use professional products, and are trained to create looks that compliment your dress, the theme of the wedding and your personality. Professional Bridal Makeup Artists understand how makeup will show up with the flash of the camera or under certain lighting conditions. Also we understand the longevity needs of a brides hugs, kisses and tears of joy. With this education and skill, your wedding photos will be “picture perfect”. 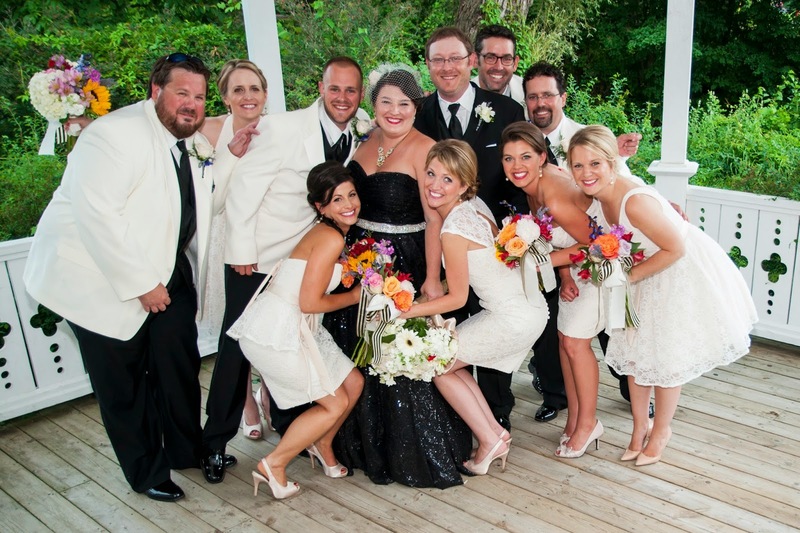 The Bridal Party will look and feel their very best as well! A professional makeup artist will take into consideration each bridesmaid's coloring and personal style to create a unique but uniform look for your entire bridal party. This will avoid the issue of the one bridesmaid who loves shimmery silver eye shadow and looks like she has disco balls on her eyelids, or the one bridesmaid who refuses to wear makeup and looks half dead in your photographs. I’m not even kidding! These are women who will be a reflection on you and will be in your photos 10 years from now. You don’t want to have only part of your bridal party in sequence and complimenting each other with their professional looks, while a few of the girls look out of place with too much of a smoky eye or not enough bronzer. 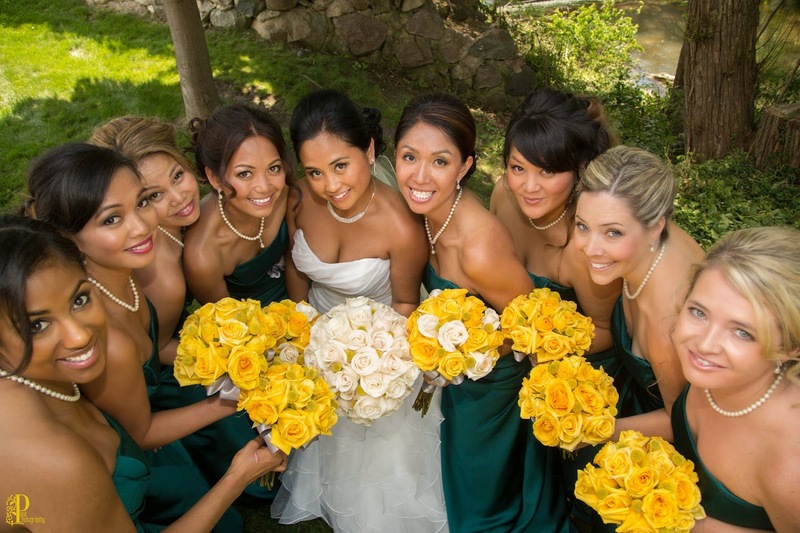 Try to have a cohesive look for you and your bridal party's' hair and makeup. Some of your bridesmaids may also be inexperienced with what hairstyle is going to look best for their face shape. Or they may not know how to accomplish the look the other girls have received if everyone is doing the same style. A professional artist can help to make sure everyone looks great together! An on-location makeup artist will come to your location of choice and help make your special day stress-free. 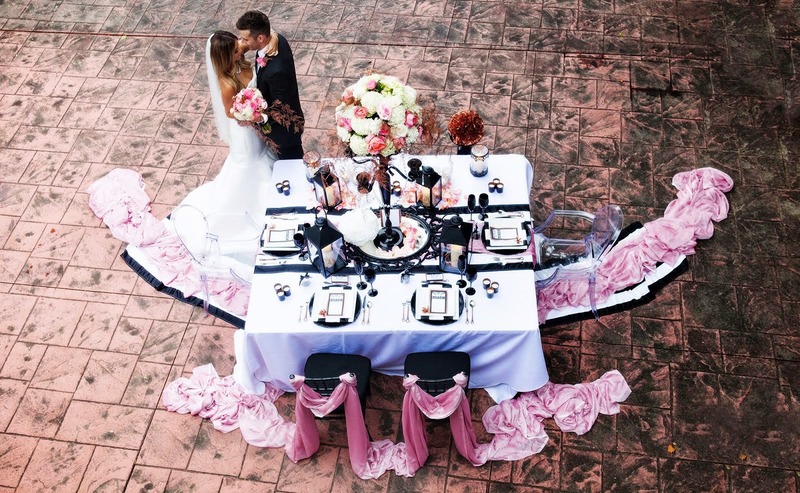 They will create an environment where you will feel pampered and totally relaxed before the festivities begin so you can start your forever with the one you love looking and feeling your absolute best! SUMMARY, Viewing a makeup artist’s work and researching your makeup artist is so important. You want to make sure your makeup artist has a top quality portfolio. It can be a personal website (which is always best because it looks more professional) or a Facebook Fan page, Twitter, or any wedding blogs their work may have been featured on. You want to make sure their work matches the quality of makeup you are expecting to receive for your wedding. Also, don’t be afraid to ask for references. Even though we live in a technology based society, and it is super easy to find reviews on just about anyone or anything, don’t be afraid to get personal. Ask for names, numbers, or emails that you check in with, and personally ask how that client liked their experience with this specific artist. There is absolutely nothing wrong with checking to make sure you are making the best decision for you, for the most important day of your life! 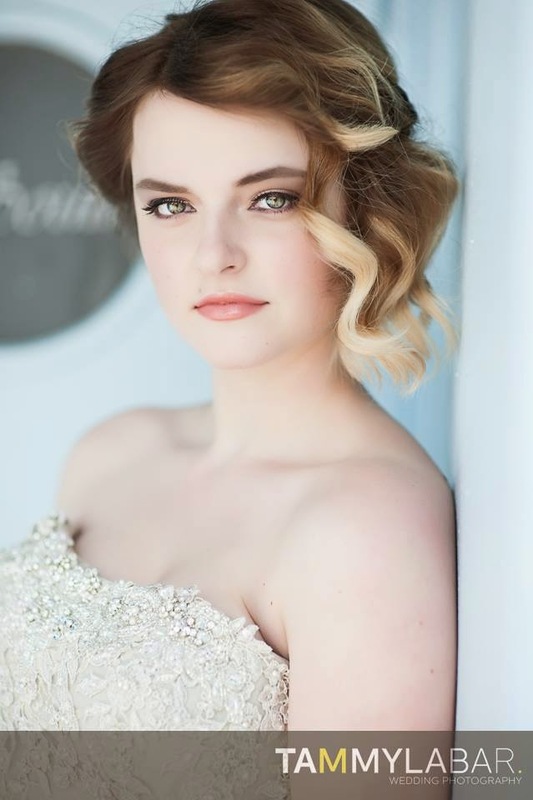 A note from your Bridal Beauty Pro Sylvia Farmer, Bridal Beauty's' Owner/ Lead Artist: "The most important thing to me is making the skin look soft, dewy, and radiant. I love a highlighted cheekbone and a soft, glossy lip"
Tracie has known the Mother of the Bride, Debbie, for about 3 years from working with her in the wedding industry as she is a florist. Debbie has created beautiful flowers for my clients weddings and now she was able to create amazing flowers for her daughter Bree's wedding. I was thrilled when Debbie decided she needed to enlist in my help with rehearsal and day-of coordination services so she could try to relax, talk to guests, not worry about the schedule of events and other details that come with weddings. Debbie and her husband Ken along with Bree and Jim worked so hard to plan an amazing wedding. They have very large yard that surrounds their farm house in Plymouth. I know they must have worked hard for months to prepare the yard as it was meticulous. 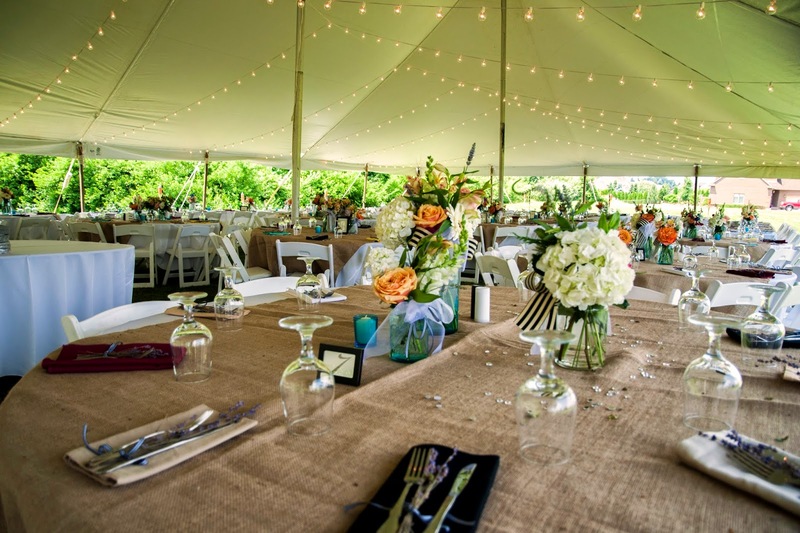 If you have ever planned a tent wedding like they did then you will know you must bring everything in and I mean everything right down to the salt and pepper shakers for the tables! 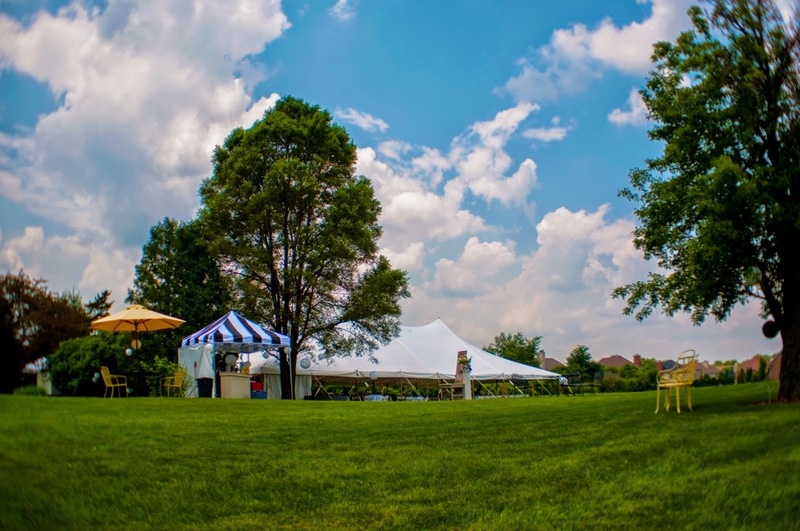 I started working on the event a short 3 weeks before the wedding. I think I drove her nuts (LOL) with all my emails and phone calls that were needed to make sure everything was accounted for so nothing was missed but in the end it was a fabulous day so it was all worth it! I started the day at the home to help with set up inside the tent. Debbie had collected vintage colorful napkins that myself along with her designer friends placed at each place setting. We adorned the top of easy napkin with a sprig of lavender, made sure candles were in place, fans were ready to go and tended to other details. I headed over to the Mill Race Chapel to being pinning the flowers on the men and then it was time to start the procession. 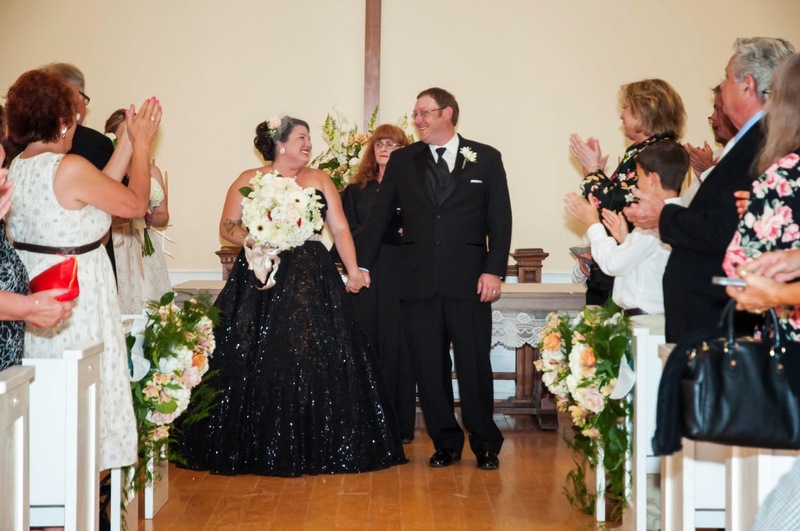 The bridesmaids wore white dresses while Bree, the bride went totally outside the box and chose a Black Wedding Dress. She looked absolutely stunning with her birdcage veil to complete her look. Jim waiting anxiously at the aisle to get a first glimpse of his bride and boy was it worth the wait! These two are so cute together and everyone could feel the love in the air! Once the ceremony was under way by Rev. Victoria I headed back to the house to make sure everything was in place and do a little trouble-shooting as the bartenders were texting me questions when I was on my way. 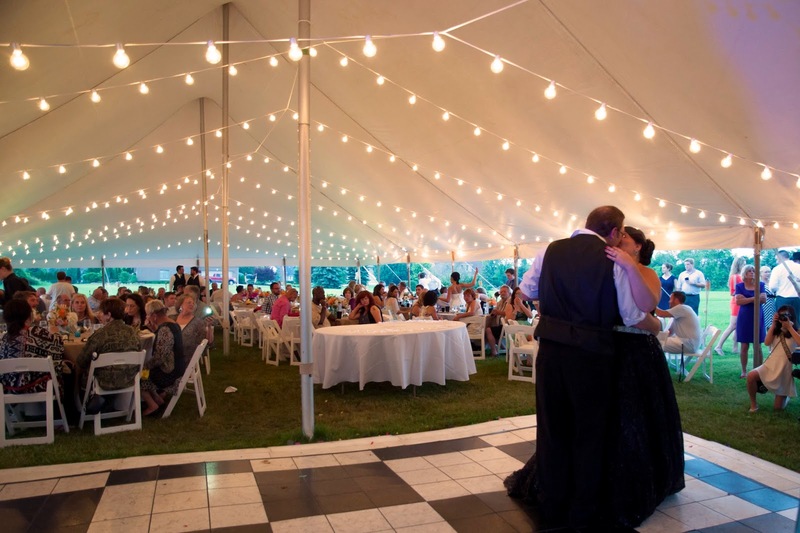 We did have some light showers just as guests started to arrive so we had to make a few minor adjustments to our seating card table which were vintage keys and then once it cleared up we were able to quickly move it back out from under the tent. Guests started to enjoy the signature drink of Raspberry Vodka and Lemonade along with all the other selections of the evening. It was quite hot out so we did go through a lot of drinks and ice! Congratulations to Mr. and Mrs. Darson it was a joy to be part of your special day! Tracie was thrilled to be contacted by the Fontana family to provide Day of Coordination for their daughter Lauren's June nuptials. 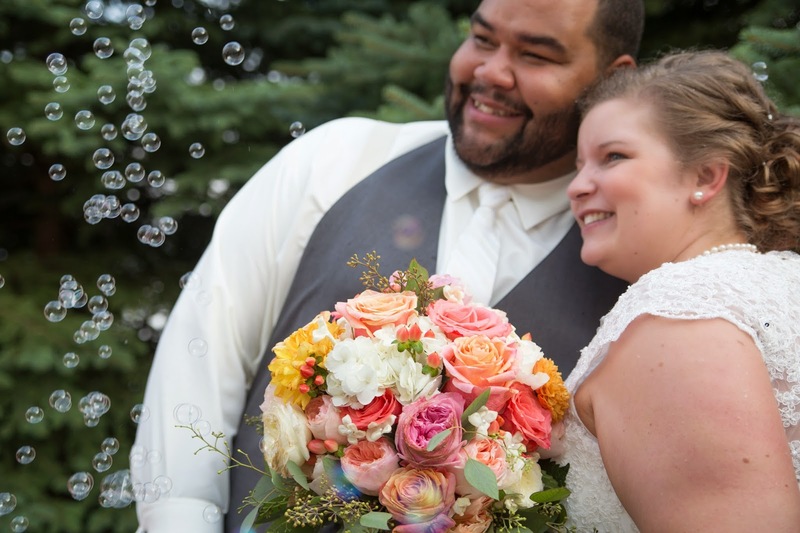 Having previously provided DOC services for both of Lauren's sister's weddings, Tracie was looking forward to working with the family again and seeing how their families have grown. Here is Lauren with her sisters Denise and Lisa also former YTB Clients! YTB left Metro Detroit bright and early to head to the west side of the state for Lauren and Tim's vintage barn wedding. 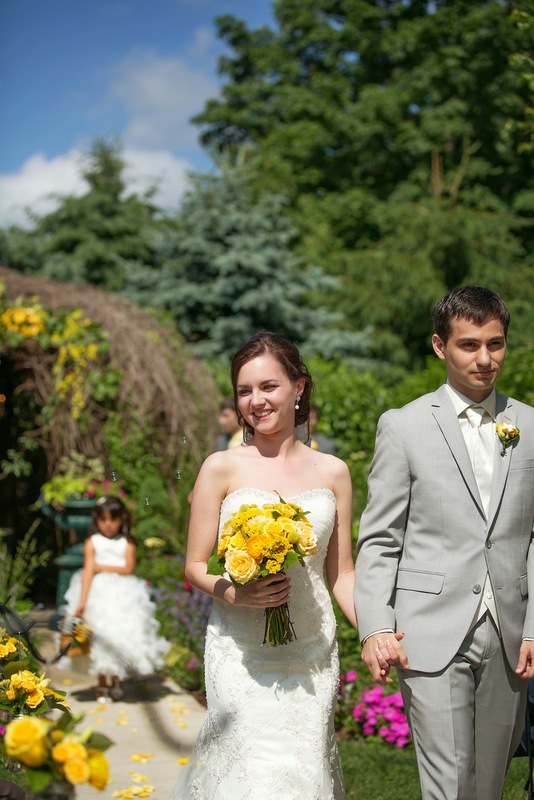 The warm sunny day was perfect for an outdoor ceremony. The team arrived at Mill Creek Barns in Watervliet MI. at noon to help set up the reception space inside and the cocktail hour outside. 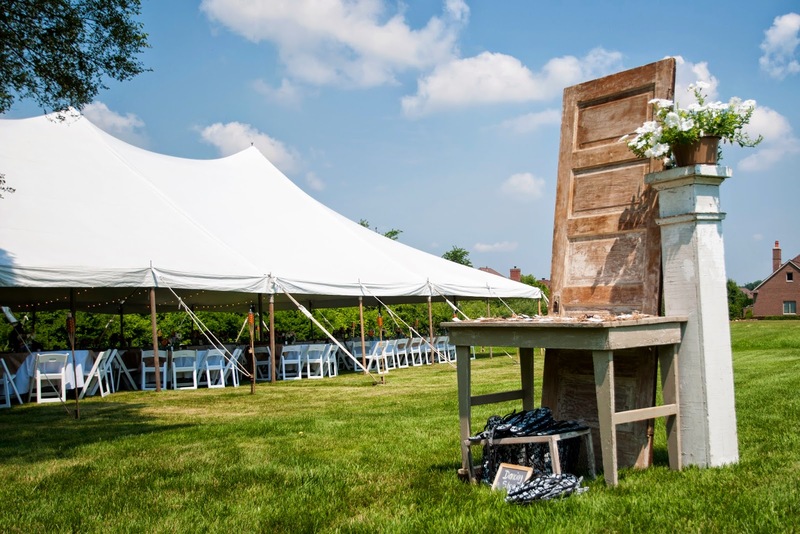 As the caterers got to work on setting up the tables, we started setting up the place cards, chalkboard signs, photo booth area, bathroom baskets, card box, guestbook, pie tables, centerpieces and all other decor to the already beautiful barn. The centerpieces consisted of purple and white hydrangea with some baby's breath. YTB along with Nanny Ohla and Lauren's grandmother and aunt helped cut and prepare the flowers for the centerpieces. 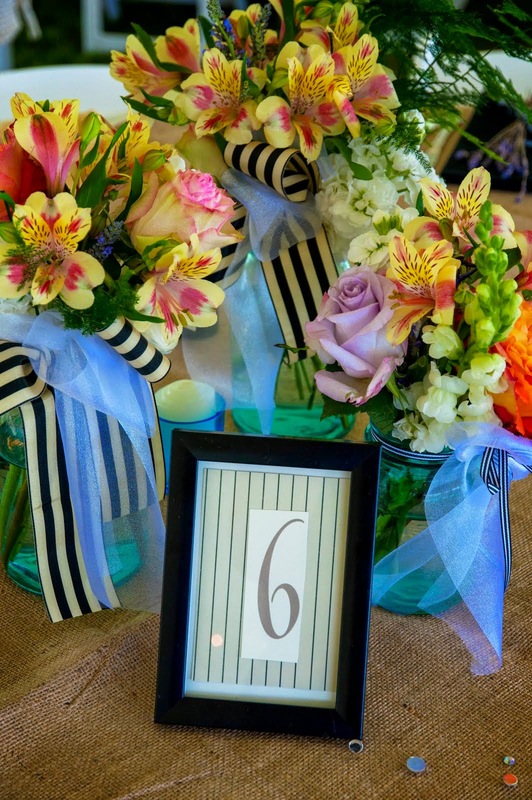 We used a mix of smaller blue mason jars and larger transparent mason jars for the centerpieces and tied little chalkboards on them with bits of twine to write the table numbers on them.We also placed menus on the tables tied with the same twine used on the mason jars to complete the tablescape. The tables were draped with white linens, burlap table runners and purple napkins to compliment the hydrangea. The finished product was a gorgeous dining room with a vintage rustic feel. 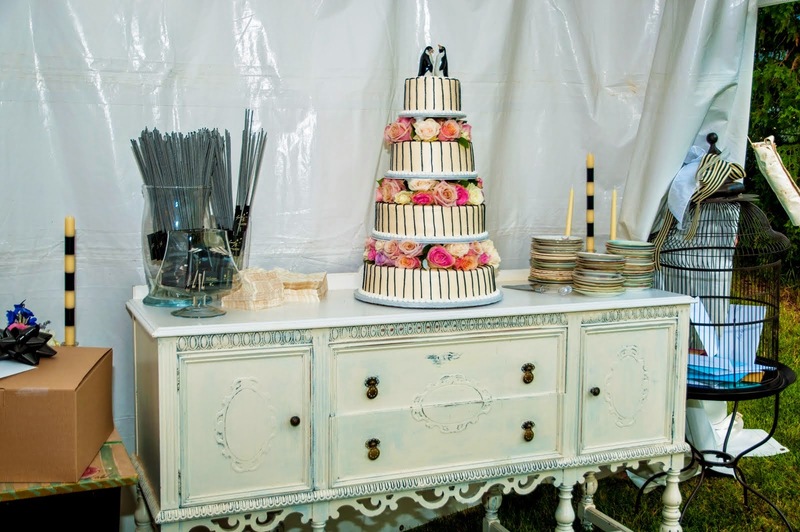 In lieu of traditional wedding cake and to go with the country feel, the couple chose to have a pie station. The variety of pie flavors were blueberry strudel, cherry crisp, apple crisp, raspberry-rhubarb, pumpkin, and sugar free. Lauren and Tim brewed their own beer to give away to guests as favors. To finish off the reception space, we draped a "Mr and Mrs" sign over Lauren and Tim's chairs. We had to work quickly to fix a spelling error on the sign as it came misspelled out of the package. With the help of the Mill Creek Barn staff we were able to secure a new photographer after the photographer bowed out before the ceremony. Jennifer Mayo, graciously agreed to shoot the wedding and came right out to save the day. With no time to spare she arrived with her assistant and the beautiful ceremony began. The bridesmaids wore amethyst purple and carried white hydrangea bouquets. 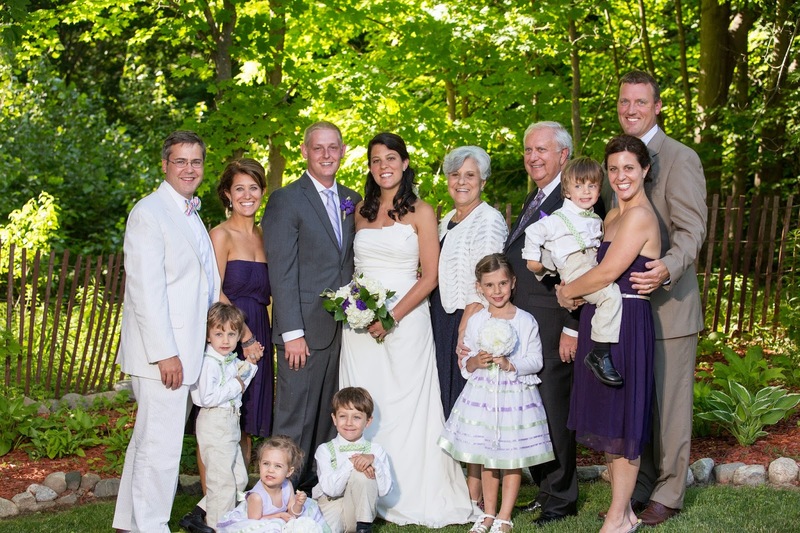 The groomsmen wore tan suits with purple ties to match the purple color scheme. Lauren and Tim's best friend Bella was also a part of the wedding. She was so well-behaved the entire time before and during the ceremony. After the ceremony I had the honor of driving this adorable dog to doggie daycare. Lauren and her parents were smiling from ear to ear as they walked together toward an impatiently waiting Tim. The sand ceremony was the perfect way to symbolize the joining of the two families into one. This sign says it all! After the ceremony it was time to celebrate this special union. The cocktail hour was outside and guests mixed and mingled while the Bridal party took turns taking photos and hanging out with the rest of the guests. Guests were given mason jars to drink out of to add to the country theme of the wedding. When it was time for the reception, the guests easily flowed inside to continue the party. After the fabulous grand entrances from the bridal party and bride and groom, the speeches were intermixed during dinner. 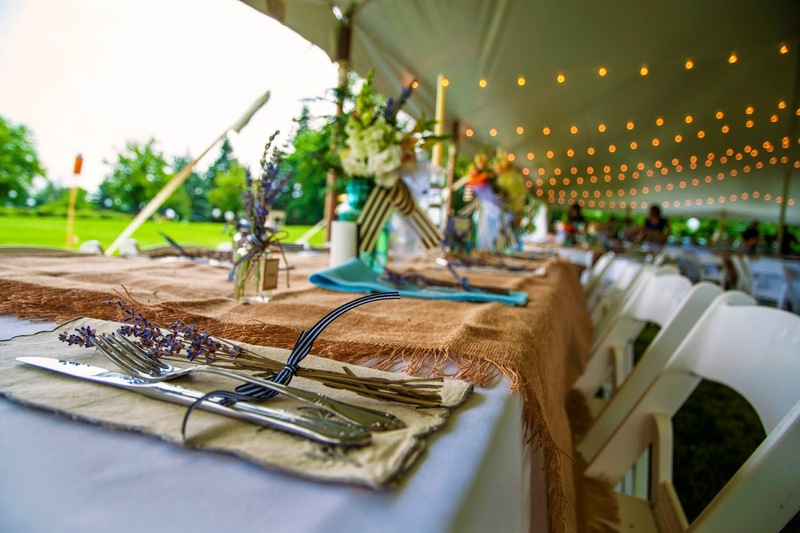 The guests were served grilled shish kabobs, pork tenderloin and country sytle mashed potatoes to go along with the country feel of the wedding. The bride and groom cut their pie and guests enjoyed their wedding pies, as well. After dinner it was time to get the party started again. The ceremonial dances were lovely and the guests gathered around to watch. When the band started playing the guests packed the dance floor. Using the Wedding Booth for iPad app and an iPad stand, the couple created their own photo booth and brought in props. The guests had a blast. When it got dark, there was also a bon fire pit set up for guests to gather around and enjoy. The transportation services that night were bright yellow school buses. YTB is honored to have been a part of your special day. How do hotel room blocks work?